It’s a bit of a technical update this week on permitted development, for those of you involved with converting a non-residential property into a dwelling. But it is an important one and it’s all because of changes to the planning rules. 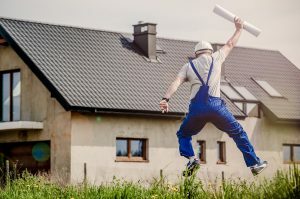 The new “Permitted development rights” or “PDRs” for short are being introduced in England and Wales to replace existing statutory planning rules for certain types of conversion. These include the conversion of certain types of business premises to create new dwellings. The types of premises include those that, before the change of use, were used as “shops, financial and professional services, betting offices, pay day loan shops, amusement arcades or centres, casinos, offices, storage or distribution centres and agricultural buildings.” HMRC Business Brief 9/2016. What does this have to do with VAT? It’s all to do with the current VAT law and the requirement that conversions require and satisfy statutory planning consent. Let me explain. There are currently two very important ways of saving VAT on these conversions. The first is the 5% rate that allows contractors to charge the 5% rate on certain conversion work. The second is that in certain situations, property developers can claim VAT on their costs from HMRC, if they make zero-rated “supplies” by selling the freehold of the finished dwelling or grant a long lease in the property (over 21 years; 20 years in Scotland). Commercial developers who convert non-residential properties into dwellings and zero-rate the sale of the new dwellings, which means that they can claim most or all of the VAT on their costs. DIY home-converters who want to claim VAT on costs under the DIY home-conversion scheme. Contractors who carry out conversion services for developers, whether commercial developers or DIY home-converters and whose services would otherwise qualify for the 5% reduced rate. However, you only qualify for these reliefs if the developments meet certain strict criteria set out in the VAT legislation. One of the criteria is that these developments must have required and received statutory planning consent (“SPC”) and that the development fulfills all aspects of the consent. Because these developments will no longer require SPC, HMRC has confirmed that they will accept alternative documentation confirming that the development is covered by the new PDR scheme. Detailed guidance about the new requirements is set out in HMRC Business Brief 9/2016 . a) Written notification from the LPA advising of the grant of prior approval. or b) Written notification from the LPA advising that prior approval is not required. or c) Evidence of deemed consent (ie evidence that you have written to the LPA and your confirmation that you have not received a response from them within 56 days) and evidence that the development is a permitted development. This will include all of the following (where the documents have been created), plans of the development, evidence of the prior use of the property (eg evidenced by its classification for business rates purposes etc. ), confirmation of which part of the planning legislation is relied upon for the development and a lawful development certificate where one is already held. This is an important development and I’d strongly recommend that anybody involved in non-residential conversions should read the HMRC Brief carefully.